Come in from the cold and be captivated by the multi award winning, husband wife duo, Twin Flames. Combining the musical talents of Jaaji (Inuk Mohawk from Nunavik) and Chelsey June (Algonquin Cree Métis) from Ottawa, Twin Flames take listeners on a musical journey across Canada and the Arctic, as they echo the voices of their ancestors and depict life on the land singing songs in English, Inuktitut and French. Their music pushes the boundaries of contemporary folk, incorporating traditional instruments. This performance will also feature a selection of holiday favourites, including Silent Night sung in English, Inuktitut and French with a rich blend of Twin Flames signature harmonies. 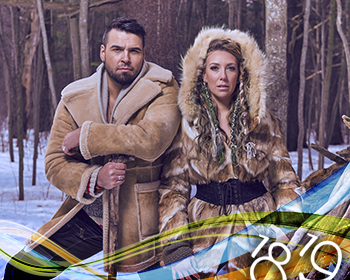 Last year, Twin Flames won the prize for Aboriginal Songwriters of the year at the Canadian Folk Music Awards and picked up nominations for Vocal Group of the Year and World Group of the Year. This holiday season, treat yourself to a uniquely Canadian experience with Twin Flames!